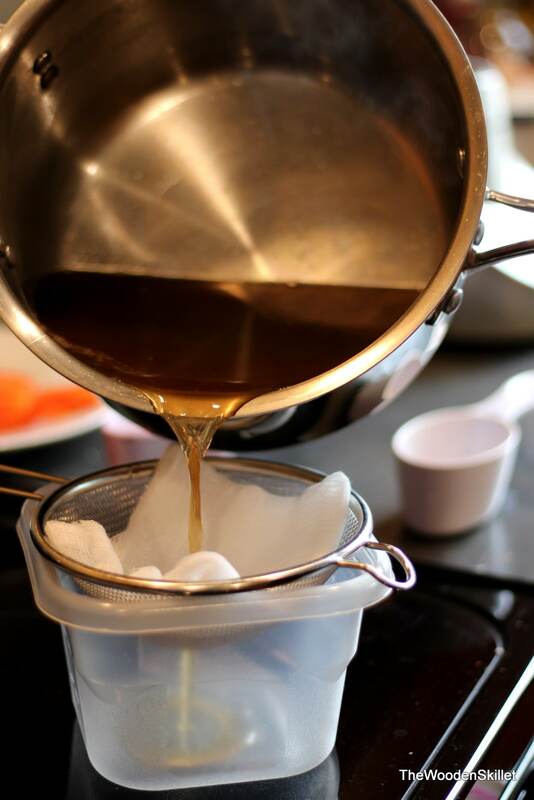 How to Make Maple Syrup – a step-by-step tutorial! 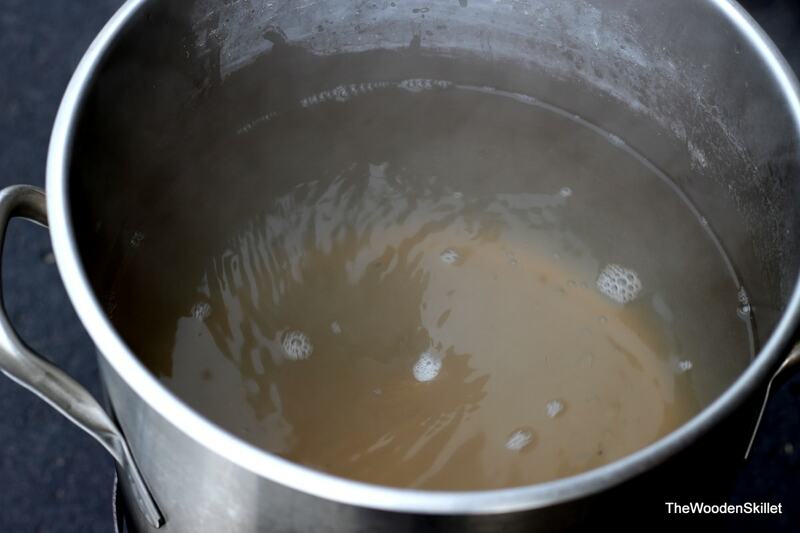 What do you use to boil sap in? 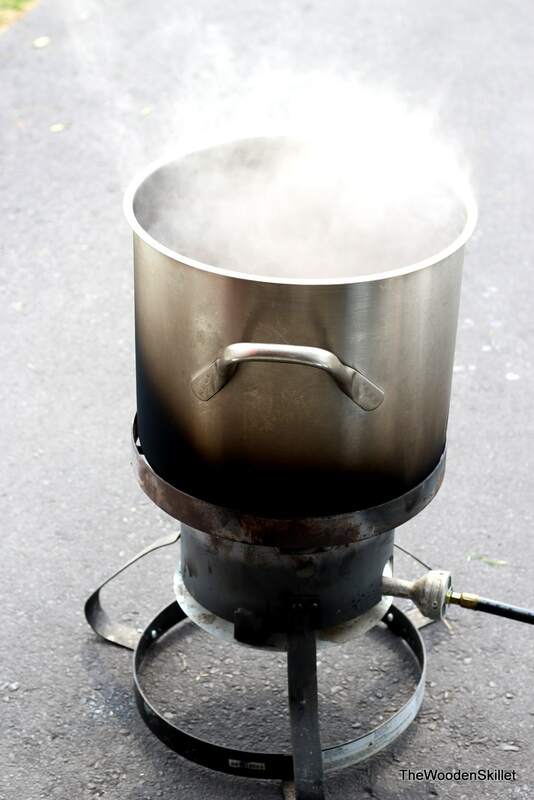 Here is the contraption my ever-so-handy husband put together: we used a turkey fryer and a 22 qt pot (insert appropriate lecture about being smart and careful…). On this particular day, we started with approximately 5 gallons of sap. 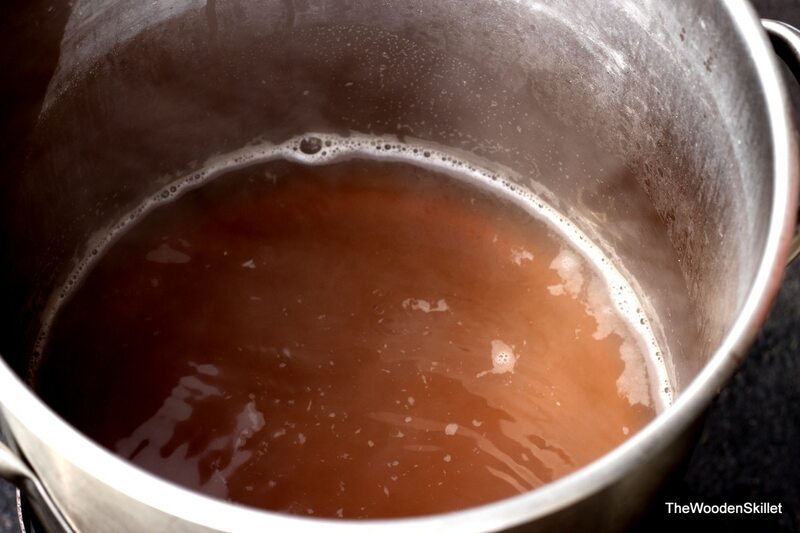 The main way that can tell sap is finished and has turned to syrup is based upon the temperature at which it is boiling. 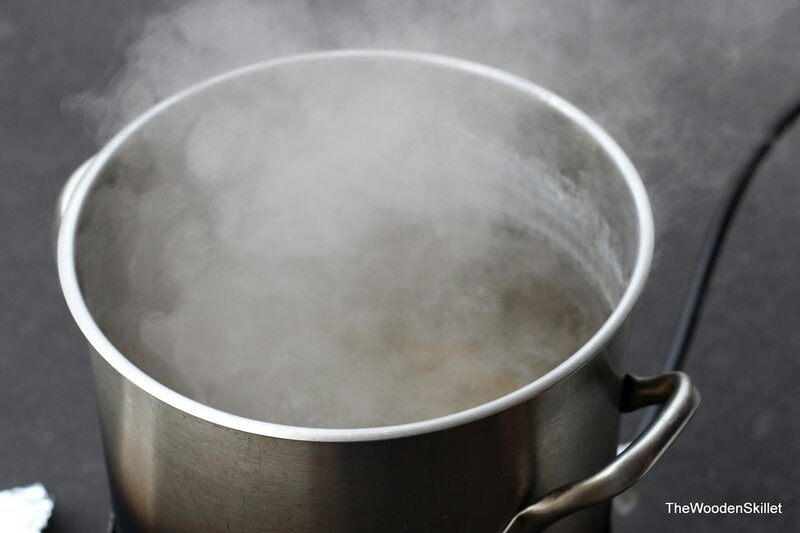 The boiling point of water is 212 degrees. 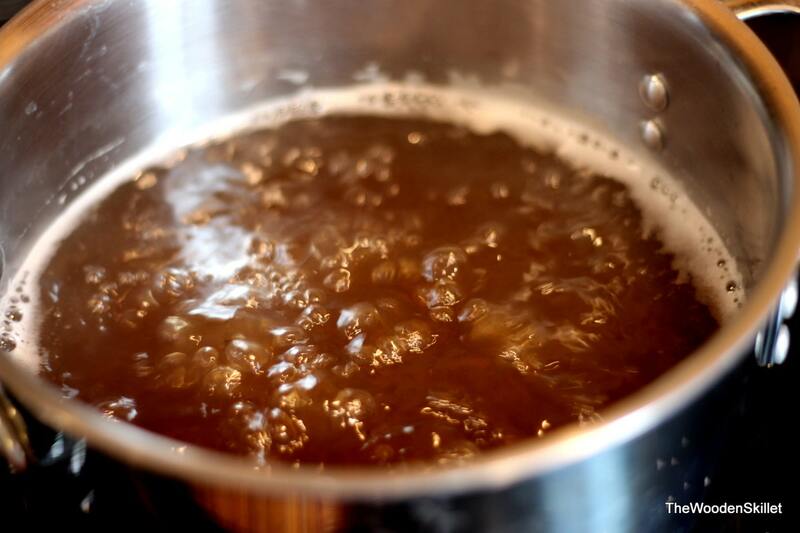 The boiling point of syrup is supposed to be 219 degrees (as the sap is reduced and the sugar content increases, so does its boiling point). So, ultimately, you want to temperature to reach 219. If you are outside boiling sap, like we did, it is best to take it inside when it reaches approx. 215 degrees. You can then remove it and complete the reduction inside on the stove. 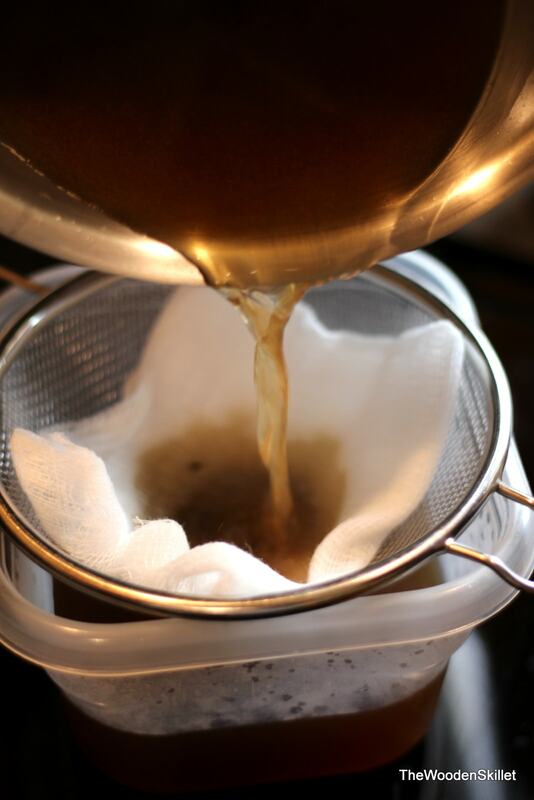 While you are boiling sap, you can sanitize whatever bottles or containers you want to store your syrup in. You can sanitize glass bottles by placing them in boiling water for 30 minutes or you can run them through the Sanitize cycle in your dishwasher. Once your boiling point has reached 219 degrees, you can remove it from the heat and strain it through an Orlon filter using a disposable felt insert- below we just used cheesecloth, but the Orlon filter with disposable insert would have been better. It does a better job of catching any residue and giving your syrup a smooth finish. 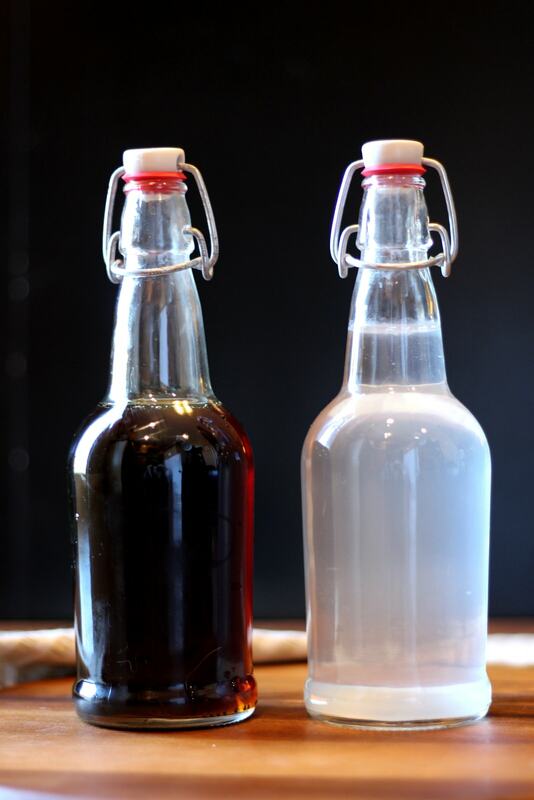 Clear bottle is sap and darker bottle is (obviously) the finished syrup – pretty cool! Are there different grades of maple syrup? A little bit about Grades of syrup. There has been a recent change to the different Grades – there used to be Fancy, Grade A Medium Amber, Grade A Dark Amber and Grade B. They changed them, in part, because a lot of people thought that Fancy would be better than Grade B, just because of their names – which were misleading. Now, there is only Grade A, but with varying types within that Grade. They are: Grade A Golden Color with Delicate Taste; Grade A Amber with Rich Taste; Grade A Dark with Robust Taste; Grade A Very Dark with Strong Taste. The picture above is most likely a Grade A Dark with Robust Taste or even a Grade A Very Dark with Strong Taste. I am by no means a syrup-expert, but it is my understanding that while you can get varying Grades at any point in the season, you would most likely get Grade A Golden Color with Delicate Taste at the beginning of the season and Grade A Very Dark with Strong Taste as the end of the season. One type of syrup is superior to the other – it all depends on your own preferences and tastes. I happen to really like the robust flavor of the syrup above and probably prefer it to the delicate grade. I had to do a photo shoot withe the syrup – of course! The syrup I used for these pictures is most likely Grade A Amber and it does look better in pictures – I have to admit. I hope you guys have the opportunity to try making your own maple syrup (sorry for those you don’t live in the Midwest or Vermont….) – if you ever have the opportunity, don’t pass it up. And never pass up a chance to try real maple syrup. It is so much better than the corn syrup based stuff – can’t even compare it.